Mobile applications first appeared in 2008 and since then the market for it is just going on fire. Mobile apps have become an essential need for businesses to capture the modern customers of today. App developers from all over the world are just striving to fulfill the customer needs of better user-experience on mobile. hybrid app development comes up as a boon to the app development technology. It is become challenging & confusing to develop a perfect app and choose a right technology of app development for your business. Well, there are two approaches for mobile app development – first is Native App Development (iOS & Android) and second is Hybrid App Development (Cross-platform). Native applications are apps developed with a specific platform in mind either iOS, Android or other. For example, you could have a Native mobile application that is intended to run exclusively in iOS or Android. The operating system used by Apple mobile devices or Android mobile devices. Native apps have a tendency to take full advantage of the features of a given operating system. But it can take more time and effort to keep them up to date. Hybrid Mobile App technology leverages the developers to write a single piece of code and execute it on the different operating system like Android, iOS & Windows etc. In Hybrid App you need to develop only a single app and that will run on multiple platforms. These apps don’t take extensive development time. It’s called a hybrid because it holds two parts; the first one is the back-end code, which is built using the languages mentioned above. The second part is that of the native shell, which makes the app downloadable. Once a hybrid app is made, you can propose it to all the available stores like AppStore and Google PlayStore. 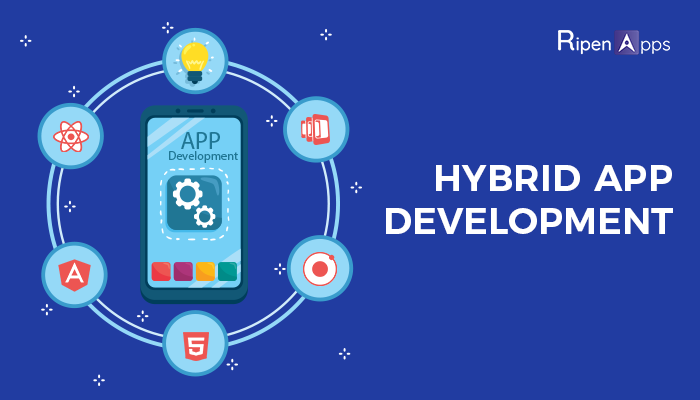 The Hybrid App Development technique is gaining immense popularity and priority in the app development world because of its advantages & payback. Now, it’s time to take a closer look at some of the main advantages of hybrid app development. Instead of including every single positive aspect of hybrid app development, we are pointing solely on their advantage over native & web apps. Building a Hybrid mobile app is relatively cheaper and gets the process done earlier than native or web mobile app. In the era of competition, where marketing has become critical than ever, cost efficiency holds a prominent place in helping enterprises build & get their product to market as soon as possible. Xamarin, PhoneGap and many other frameworks make developers accelerate the app development process and help to save cost & time. A predictable user experience over different mobile platforms is one of the principal purposes for hybrid application’s prevalence. Users anticipate that the application will be right away responsive on various devices and convey a glitch-free experience. Hybrid applications depend on the possibility of “information is only a tap away”. And keeping in mind that it shows information speedier and changes with various devices screen configuration instantly, it additionally settles the issues of the fluctuating data spilling capacities. Being lightweight, the hybrid application ui ux design can likewise stack the top-notch designs and substance rapidly. Like native applications, hybrid apps use the device’s interior programming framework through an overlay which empowers consistent synchronization with other compatible applications. This decreases the integration issues for designers. Thusly, the hybrid applications function admirably with the device’s native apps, for example, camera, messaging, GPS, and so forth to guarantee a smooth user experience. Hybrid applications store the device’s API to save offline information that heaps the application rapidly. It partially stores data that the users can access at the season of poor or no network. Since a majority of users need to reduce their mobile data utilization and have a continuous access to application’s information, a hybrid application is equipped for giving only that – offline app openness without execution glitches. It is one of the essential reasons why hybrid mobile applications are the best when contrasted with native mobile applications. Not at all like a web application, a hybrid application is intended to make utilization of the considerable number of features accessible in the mobile phone. Despite the fact that native applications likewise use the entire device features, keeping up it is a significant challenge for users and developers alike. Developers need to take off new updates as new forms and users are required to update the application each time another new version is propelled. A hybrid application sidesteps forming and makes application maintenance as basic as updating a site page, that too progressively. This level of adaptability additionally encourages the versatility needs of enterprises. A mobile app is an imperative tool for every business to penetrate the market quickly & stay competitive. And a hybrid mobile app development makes this task a whole lot easier & faster. Hybrid Mobile App has a prominent place in every situation where fast development is the main priority. Also where the high cost of targeting each platform with each native app would be downright prohibitive. The companies who need to stay on the top of latest development are not likely to deny performance and control. If you are looking to capitalize through a hybrid app of your own, contact us now to discuss the requirements.